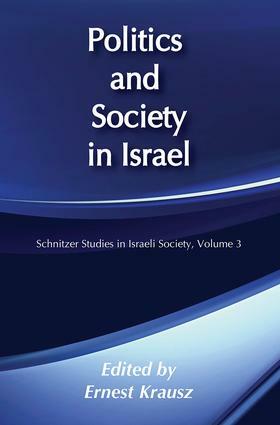 This series of the Israeli Sociological Society, whose object is to identify and clarify the major themes that occupy social research in Israel today, gathers together the best of Israeli social science investigation that was previously scattered in a large variety of international journals. Each book in the series is introduced by integrative essays. Each volume focuses on a particular topic; the first volume seeks out the dynamics of conflict and integration in a new society; the second volume is concerned with the sociology of a unique Israeli social institution—the kibbutz. The third volume presents sociological perspectives on political life and culture in Israel. Articles by leading scholars deal with: historical development; political culture and ideology; political institutions and behavior; the social basis of politics; and social change. Volume III also includes a select bibliography. Contributors to Volume III (tentative): Karl W. Deutsch, Yonathan Shapiro, Dan Horowitz, Moshe Lissak, Daniel Elazar, Asher Arian, Charles Liebman, Erik Cohen, Yoram Peri, Ephraim Yaar, S. Smooha. Political Legitimacy in Israel: How Important Is the State? The Ethnic Lists in Election 1981: An Ethnic Political Identity?